This flag is a symbol of our nation. It is the banner under which men and women fought and died to preserve the way of life for which our flag stands. In every battle, in every land, wherever our armed forces are found, the flag flies above them – around them – and before them. This weekend we celebrate Memorial Day. The celebration will be marked with parades, picnics and backyard barbecues. And whether we consider ourselves to be a hawk or a dove, it is a time to remember those who laid their lives on the line to give to us – and to maintain – the freedoms that we enjoy today. Freedom is not free and the freedom we now enjoy came at a great cost to many people. Our constitutional Republic was, and still is, a unique concept in a world filled with tyrant leaders and despot rulers, but our liberty came at the cost of those who came before us. And most of those who gave their lives, did it willingly, because they believed that this new found liberty was more important than their own lives. Those men and women who sacrificed for us did so for the future good of their nation, putting aside their personal comfort and safety. 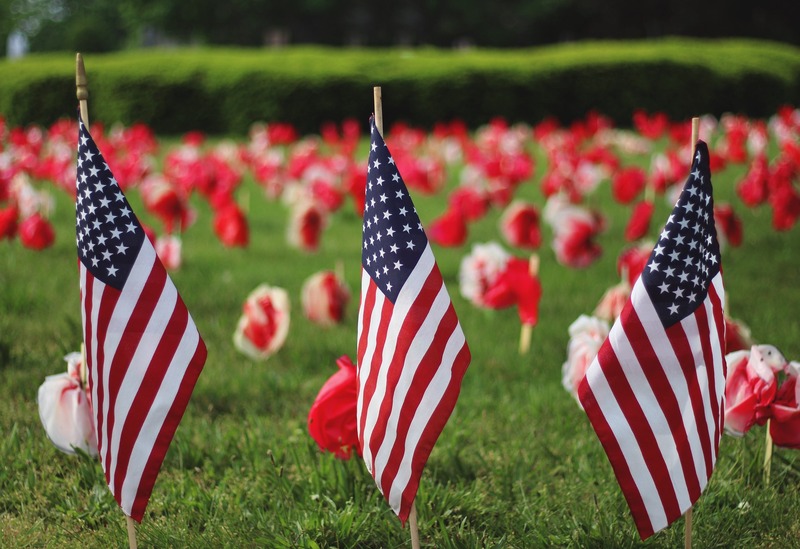 The apostle John recorded these words of Jesus: “Greater love has no one than this, that he lay down his life for his friends.” And so we pause to honor those who fought for our freedom – giving their lives, not just for friends and family, but for total strangers. And although this is the day we remember those who lost their lives in the fight for our freedom, we also need to remember those who fought and survived and who are still fighting today. We just had the lesser known Armed Forces Day. It was on the 19th of this month and it calls us to honor those who are presently serving in all the branches of service, both here at home and all around the world. We also have Veterans Day to honor those who have served in the past and are still with us today. And so on this Memorial Day I hope we can honor not just those who died for our freedoms, but those who fought in the past and those who are still fighting to guarantee our freedoms and our way of life. I, for one, appreciate the honor our current president bestows on our veterans, and even though he is not a veteran himself, I believe he truly understands their sacrifices. Many of them have had to leave their families for weeks, months and even years. They went to serve their country, while their friends finished school and started working on their careers. Too often they lost their innocence because they saw things that people shouldn’t have to see. My own dad was a Navy Sea-Bee in World War 2. He built air strips in the Philippines and he was one of the lucky ones that made it home alive, but still, there was a cost for him. He had to leave behind a young wife and wasn’t able to start his family or career until the war was over. Like many others, he didn’t talk much of those days. When you asked him questions, you could see the distance in his eyes as he recalled the brutality of that experience, then he would say that some things are not worth repeating. But, freedom is not free and what he sacrificed for his country is still being sacrificed by young men and women today as they serve in the armed forces all around the world. And then there are those who are not in the military but who still put their lives on the line for the safety, freedom and liberty of the citizens of our country. I am talking about our police officers, fire fighters and EMS personnel. It saddens me greatly that those who put on a uniform to protect us from ourselves, are now being targeted. So that verse from John’s Gospel applies to them as well, because they willingly put their lives and personal safety on the line every day. I think these verses offer us a couple of reasons for focusing on the true meaning of this holiday. “The great cloud of witnesses that surround us” are those who have gone before us and paid the price for our freedoms. Consequently, we should be living our lives in a manner that proves their sacrifice was worth every bit of the price they paid for us – to live in that hard won freedom. Our founders laid down the foundation of freedom on which our country is built – and they are watching to see if it can endure. And that leads to the second thing I see in these verses. It is up to each succeeding generation to build on the firm foundation that they have been given. And that includes us in this generation. We are to continue to persevere in the path that was laid out from the time our nation began. We need to persevere and hand off the good work to the generations that follow us. And one of the certain foundations they laid out is the fact that we are “One nation under God.” Why? Because, “We hold these truths to be self-evident, that all men are created equal, that they are endowed by their Creator with certain unalienable Rights.” And as we pause to honor those who have paid the price to save this great nation, we must also realize that as Christians we will always be in a war and that we too will be fighting to remind others of the Judeo-Christian foundation of this great nation. We are responsible for carrying the cross of Christ forward in our nation. We are responsible to show them that what they did was not in vain. I am a soldier in the army of Christ and all of us here today are part of that great army. We are the ones who pick up the banner that has been carried by others through the years. We are the ones who keep the faith alive and growing for future generations. We are the ones who are now setting an example for those who one day will follow us. Right now we are surrounded by a cloud of witnesses eagerly watching us run the race marked out for us, the race they ran in their times. And someday we will be among the cloud of witnesses watching future generations as they pick up the banner and follow the cross of Christ, as they attempt to drive out the darkness by the light of Christ that they will bear. what motivates people to sacrifice for a cause? The answer may not be a simple one, but for certain it takes courage. It took courage for Moses to stand down Pharaoh. It took courage for David to face Goliath. It took courage for Paul to reenter Rome. And it will take courage for each of us to face an unbelieving nation. “Courage is not the absence of fear, but rather the judgment that something else is more important than fear.” -That is from Ambrose Redmoon. Courage is not something we are born with, nor is it a skill we can acquire through practice. Courage comes with knowing what is right and then doing it. Courage comes from trusting in something or someone bigger than ourselves. For many people that something is a cause, a dream, a career or even money. But for those of us who follow Christ, courage can only come from One who is much bigger than us – and much bigger than the universe itself. Courage comes when we trust in God. God tells us that He is our refuge and our strength. He is there to catch us when when our world seems to be falling all around us. When we take refuge in God, no storm can overcome us. Even though death may overtake us, we still live because we live in God. God promises eternal life to those who accept Christ as their Savior. Scripture teaches that this present world is passing and we need to be concerned more with the future – eternal life that awaits us. We need to live life here on earth, but we also live for eternity. Scripture teaches us to fear the one who can kill the soul, but don’t worry about the one who can merely kill the body. Yes we fear for our lives here on earth, but we also know that when our life here on earth is done, we will live on forever with our Lord and Savior, along with that great cloud of witnesses who went home before us. So we pause to honor the fallen, let us also honor the great cloud of witnesses who are watching the race we run! It is those who we will one day join in eternity. It is those who ran their race and now have their eternal reward. God set a plan in motion and each of us, and when our time comes we must run the path that He laid out before us. We can take courage in the fact that God is with us as we run His race – and we can take courage in the cheers of those who went before us, who are urging us on to the finish line. Something I would like each of us to take away from this sermon is a challenge. I have placed it in your bulletins: THINK, THANK and PRAY. Think – Remember those who served in our armed forces and gave their lives to preserve our freedom and our liberty. Remember those who served our communities and have lost their lives in preserving our safety, our health, and our way of life. Remember all those who have fought for the one true God – that have refused to deny their love for Jesus – and have paid the earthly price for it. Thank – Seek out the veterans – military, firefighters, police officers and all who served us both at home and abroad – and thank them. And Pray – Keep those who are presently serving in our prayers – that they will be found faithful in the cause laid upon their shoulders and that they will return home safely when their duty is done. And pray that each of us has the courage to proclaim that Jesus Christ is Lord. ← Michigan Criminal Justice Reform: Too Much, Too Soon?